Repo-bitbucket.js is a jQuery plugin that alows embed public bitbucket repository on your site. 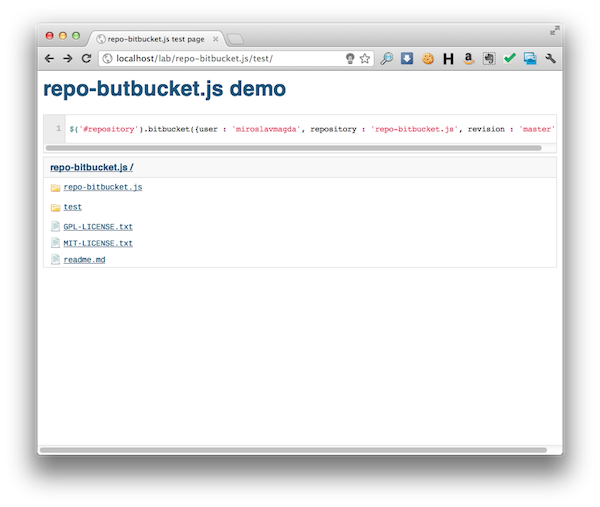 Repo-bitbucket.js is influenced by Darcy Clarke's repo.js. Repo-bitbucket.js uses (like [repo.js]) Markus Ekwall's jQuery Vangogh plugin for styling of file contents. All code is open source and dual licensed under GPL and MIT. Check the individual licenses for more information.